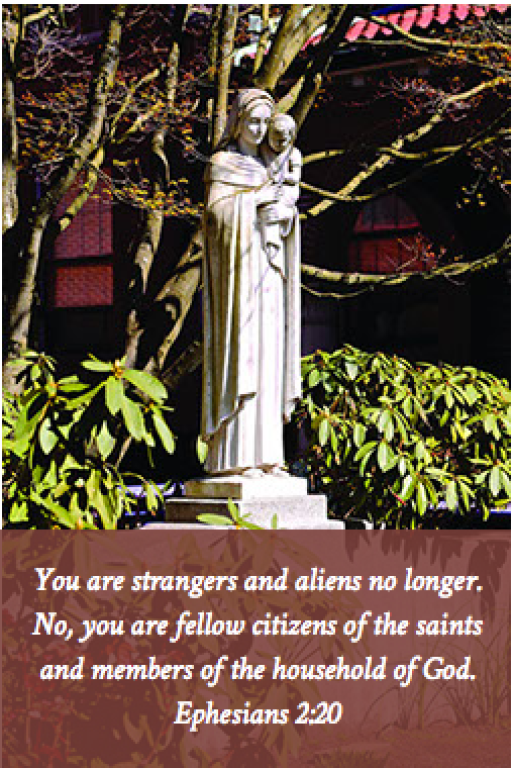 From its dedication in 1926, St. Mary’s Cathedral has stood as the gracious center of the Archdiocese of Portland in Oregon. The cathedral belongs to the 400,000 Catholics of the archdiocese and serves as a place of ceremony and celebration for those who come here. The cathedral is also a parish church, and as such it is home to its parishioners and a welcoming place for all visitors. In 1851 a small group of Catholics built a modest church near the present intersection of NW Fifth and NW Couch Streets. At the time, the area was a forested tract some distance from the center of town. In 1854, the parishioners moved their church to a more convenient location at the present SW Third and SW Stark Streets, and made additions to accommodate the growing congregation. This church became the cathedral in 1862, when Archbishop Norbert Blanchet established residence in Portland. On August 15, 1885, a completely new cathedral was dedicated at the SW Third Street location, but following the destructive flood of 1894, a pro cathedral and school were built at the present NW 15th and NW Davis Streets. In 1925, Archbishop Alexander Christie authorized the construction of a new cathedral at NW 18th and NW Couch Streets. With the support of Catholics around the archdiocese, the cathedral opened on February 14, 1926. The first service was held on February 19, 1926. With the 150th anniversary of the Archdiocese of Portland in Oregon, Archbishop William J. Levada determined that one of the principal activities of the anniversary would be the restoration and renewal of the cathedral. The work included liturgical and artistic modifications as well as seismic strengthening, and electrical, heating, and lighting updating. Again, Catholics from around the archdiocese supported the project, and the rededication of the newly restored cathedral was celebrated on February 14, 1996. The cathedral was designed in 1925 by the firm of Jacobberger and Smith. It is in the Romanesque style with some Byzantine features and covers an area of 12,000 square feet. The stained glass windows in the transept date from one of the earlier cathedrals. Statues of the Sacred Heart and the Blessed Mother were brought in by the Benedictine monks of Mount Angel. The Stations of the Cross and the Povey Brothers dome above the altar date from 1926. Other artwork, including the paintings in the apse, the lights, the stained glass windows, the etched windows in the vestibule, and the icons were either installed at the time of the restoration or in the years since then.